Shortcakes are, simply put, American-style biscuits that resemble sweet, crumbly bread that has been leavened with baking powder or baking soda. While these can be made with a variety of flavours and fillings, such as blackcurrants or blueberries, strawberry shortcake is the most popular variety of the dessert. The shortcakes are cut into half, and filled with strawberries, strawberry juice/syrup, and whipped cream that has been flavoured with vanilla and sweetened with sugar. 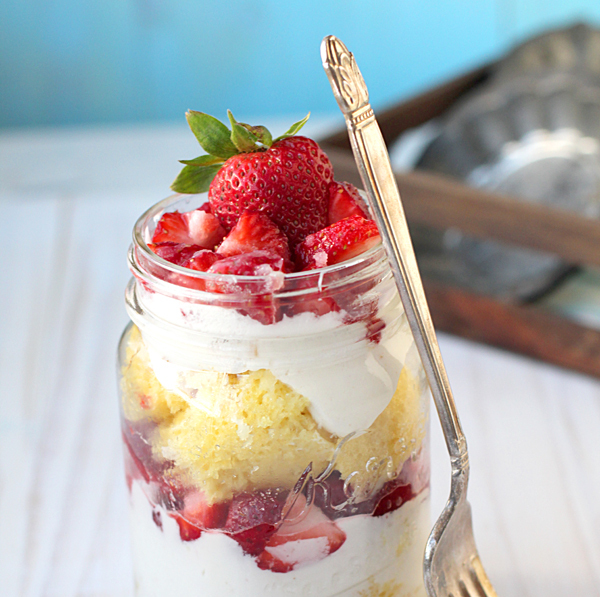 This is topped with the second half of the shortcake, which is layered with more strawberries and cream. Owing to the fact that they are much like leavened bread, shortcake dough needs to be made keeping a delicate balance of ingredients in mind. The most oft-made mistake is the addition of too much flour in the dough, which results in a tough, rubbery shortcake, with the consistency of carpet. If you find yourself with ruined shortcake on your hands, there really isn’t much you can do to change it, but you can try employing a couple of methods to fix or at worst, mask it. To begin, do not go by texture and looks alone. Your cake might look like it is ruined, but does it really taste all that bad? Make sure you break off a tiny piece and have a taste, in order to check whether it really is a baking disaster. If it doesn’t taste exactly like shortcake, but is still nice to eat, you can continue filling it with strawberries and cream, and serve it as it is, even if it doesn’t exactly look or taste like a traditional shortcake. If the cake really is terrible, try masking it. Whipped cream, strawberries, and icing sugar are your best friends for this purpose. Cover the cake in mounds of whipped cream, top it with a generous heap of sliced strawberries, and sprinkle the whole thing with lots of icing sugar, in hopes that no one can taste the ruined cake underneath. You can also use chocolate sauce or vanilla frosting if the cake you are trying to disguise is particularly terrible. Consider changing the dessert you were making. If you were initially going for strawberry shortcake, but the recipe goes awry, consider using the cake for some other dessert. Rip the cake up into shreds, dredge the pieces in icing sugar, and consider using them in something like trifle, or bread and butter pudding with cinnamon. Another great way to salvage ruined shortcake is to change the serving style. E.g. instead of stacking it as per the traditional method, you can serve it Alaska-style – tear it into small pieces, and put a few of these into a tall glass or jar, along with lots of extras like whipped cream, strawberries, sauce, and even ice cream. Finally, if the cake really is beyond fixing, consider telling your family or guests (whoever you will be serving the cake to) about the entire ordeal. They might just end up laughing it off, or still eating a bite or two, to appreciate the effort you put into it.